We have VPN apps for all sorts of different devices and operating systems, but did you know that you can also use a VPN on your router? This solution isn’t for everyone, however, so read on to see what makes it so useful and how you can install a VPN router at home! At its core, a VPN creates an encrypted and secure connection between the device it’s installed on and the internet. It gathers all of that device’s requests to access the internet and directs them through its encrypted tunnel so they can’t be read or redirected. That’s simple enough when you’re on a device with a user interface. Want to visit a website? Through the tunnel. Want to video call your BFF? Through the tunnel. But what happens on a device with no user interface, like a router? With NordVPN on your router, every single device connected to your router will have its traffic sent through the encrypted tunnel. 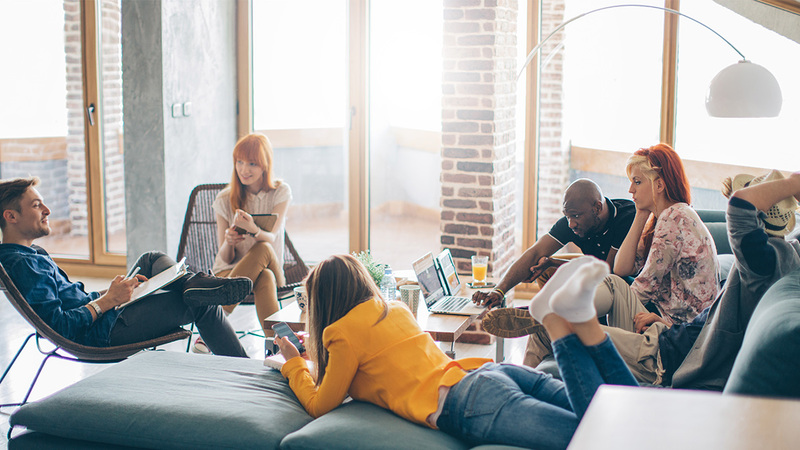 Your PC, your laptop, your home entertainment system, and even your smart IoT toaster. Always-on security and privacy. With NordVPN on your router, you’ll always be connected to the VPN service. You’ll never forget to secure yourself because you’ll be part of the VPN tunnel as long as your router is working. If any of your devices perform any automatic communication updates without your explicit participation, like account balance updates for a personal finance app, those communications will be secured even if you’re sleeping. Comprehensive home security. 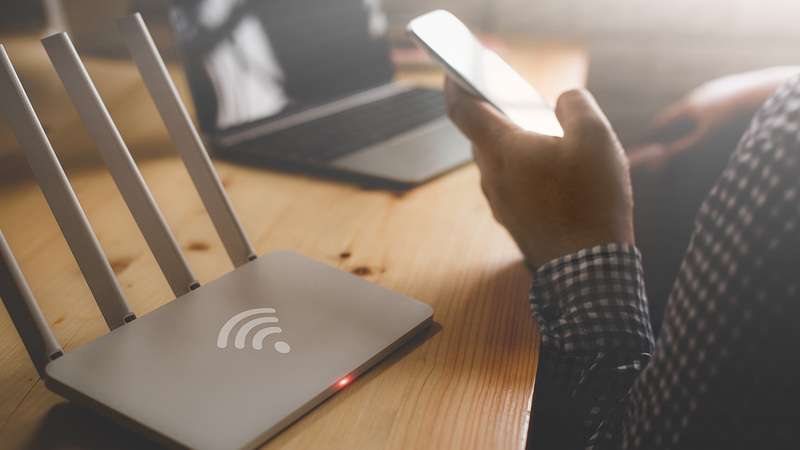 Every device connected to your home router will receive always-on coverage. It will cover new devices you get with no additional setup, and it will even cover your guests when they visit and ask for your WiFi password. Covers devices that don’t support VPNs. There are plenty of WiFi-enabled devices that don’t support VPN coverage on their own but could certainly benefit from it. Home media systems are an excellent example. Certain content on Apple TV may be blocked for viewers in certain locations. You can’t install NordVPN on your Apple TV, but by installing it on your router, you’ll still be able to change your location and access new content. Connect more devices. NordVPN allows you to connect up to 6 devices, which is already more than enough for most users. But did you know that your NordVPN-enabled router counts as only one device? If your laptop, smartphone, and desktop PC all connect over your VPN-enabled router, that’s still technically only one device connected. It’s not a good idea to abuse this feature because your connection speed and stability may suffer, but it’s an easy way to expand the number of devices your NordVPN subscription covers. Managing your VPN settings is harder. Because your router doesn’t have its own user interface (beyond a few simple buttons), you’ll have to access it through another device in order to adjust your VPN settings. Turning your VPN tunnel on and off or changing the country it’s connected to is much more convenient using NordVPN’s app, but that won’t work on your router. If you’ve left the settings on a country outside of your own, for example, you may experience needless bandwidth loss when navigating to websites in your own country as your traffic goes to the other country and back again. Configuration and encryption power depends on your router. Most routers lack the power to run anything more than the most basic encryption or tunneling protocols. You may have to decide whether you want to upgrade your router to one that supports more secure protocols or simply research what your chosen protocol does and doesn’t protect you from before using the Internet. Blocks some incoming connections. By its very nature, a VPN is designed to block incoming unauthorized connections. You’ll have an easier time initiating connections using your laptop, computer or smartphone to get around this limitation, but your less-sophisticated devices will probably remain unreachable from outside. Without a connection initiated from the inside, you may no longer be able to turn your oven on or off or to access your baby monitor from outside. Traffic between devices and the router is not secured. Because it’s the router doing the encryption, traffic between the device and the router will not yet be encrypted. However, if you have a secure home setup and your devices aren’t set to auto-connect to other networks, this shouldn’t be a huge issue. This can become a serious security issue, however, if random strangers are capable of connecting to your network. If you’ve decided that you need a VPN router in your life, it’s time to roll up your sleeves and get to work! The first thing you need to do is select a VPN that supports router connections, and if you want one of the best in the market, then NordVPN is a safe bet. Next, you’ll have to see if your router is supported as a VPN pass-through device. To find out if your router can run NordVPN, check out our tutorial page and find your router’s brand and model. 1. Log into your router. Most people have no idea that they can actually log into their router to adjust its settings. Fortunately (from a security standpoint), we can’t log into it for you. You’ll have to gain access using your product manual or service provider so you can make the changes you need to install a VPN on your router. For most routers, you’ll have to start by entering its IP address into your search bar and entering the username and password. If you’ve never logged into your router, this would be a great opportunity to change your password (here’s how to make a secure one), because many are shipped with factory default passwords that are super easy to hack! For more specific directions, check out our tutorials page. The steps you take to configure your router will depend entirely on your router’s firmware. Some routers, like many of those offered by Asus, have integrated VPN functionality. For others, you’ll have to reconfigure their settings to redirect their traffic to NordVPN’s servers. Again, the best place to find specific instructions for your specific router will be our exhaustive tutorial page. Once you’ve completed the configuration process for your router, test it to see if the connection works. You’ll be able to log into your router any time (from home) to adjust your settings, but it’s still way less convenient than using one of NordVPN’s apps. Avoid unnecessary double coverage. With NordVPN working on your router and out of sight, you may forget that you have it switched on. If you turn on NordVPN on another device while at home, your NordVPN encrypted tunnel will still be sent through the encrypted tunnel set up by your router. This can be a powerful and useful feature when using our Double VPN setting, but NordVPN was not designed to function this way through your VPN router. To avoid experiencing significant speed reductions or instability, use one method or another to connect to NordVPN’s servers. Bookmark your router settings page. Going into your router to change the settings might be inconvenient, but you can bookmark the address to make this part just a bit easier. Set up a separate router. If you have the means or the need, you can set up two routers at home – one with NordVPN and one without. 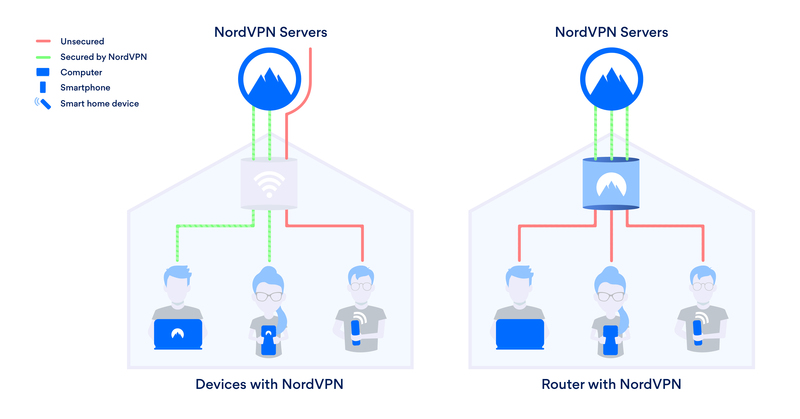 This would allow you to secure a network of connected devices at home while still using the NordVPN app with any devices that support it. Hardware VPN: Is it really what you need?